The ancient art of Transmutation has stretched and webbed itself to mean different things throughout various theologies and esoteric studies. In pure Alchemy, it is the act of turning lead into gold, whereas within the darker halls of the esoteric soul sciences, it is the act of bringing your shadows to light to become the greatest, most illuminated version of yourself. 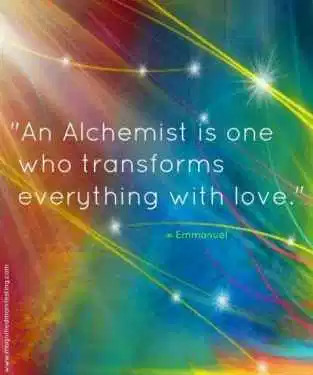 As gold is the goal within the chemical and physical processes; wisdom and joy are the goals when it comes to “spiritual” Alchemy. In modern society, we are taught as very young children to feel “good” or “bad” about certain emotions and ultimately parts of ourselves we’ve already associated with these emotions. The raising of children lead to believe that anger is unacceptable or embarrassing, or that having individual wants and needs is selfish and shameful, sows the seeds for future adults who believe that money is God and aptly surrender their lives to participate in what is deemed appropriate by the masses. I remember being SOOO damn confused as a child having adults around me tell me things like they had “wished” they had gone after their dreams, or if they could go back and do some things over they would. Seemingly putting out an underlying message or even a warning perhaps of what’s to come later in life. Whether we have figured it out yet or not, we are raised in a world of confusion, conundrums, and hypocrisy. The parent living vicariously through their children; putting more effort into seeing how their pushes and pulls on their children towards or away from certain things, is somehow worth more than putting in the same effort to manifest these types of “successes” for themselves. It never made sense to me as a child to see an adult be so talented as something, and then not do it for years because someone made a rude comment or told them they weren’t good enough at some point. Like the lack of pure, unadulterated (no pun intended) joy was worth giving up, just to keep our sad stories alive and well of why we “can’t do it” or “don’t have enough time to do it”. This isn’t and wasn’t the most confusing part for me growing up. It was rather the fact that while those around me were literally in jobs they hate, working to impress people they don’t even really like, voluntarily giving up the pursuit of their own dreams, yet somehow find the time to push us as children to “never give up” on our own. How can a child learn to express their greatest potentials with the adults around them living lives where they are doing anything but? We can keep a firm grip on our inner child, while also allowing it to keep us grounded to our roots. This is something I think many people give up throughout their lives and once we have convinced ourselves that inner child has long since gone, it becomes so much easier to convince ourselves it’s too late to become our greatest selves, which cannot happen without the acceptance and embracing of all facets of your existence, and this includes facing our darkest shadows, to allow the brightest light from with to emerge. Nigredo (Confession) – Connecting with your deepest and darkest desires, facing your shadows, proactively looking at parts of yourself without judgment. Albedo (Illumination) – Focusing on building a connection between the conscious and unconscious mind, interacting with and reading the world around you through symbols, dreams, and archetypes. Citrinitas (Education) – Transference and Countertransference work that focuses on our interactions with others and the world at large to get a better view of our place within it. Rubedo (Transformation) – Focusing on individuation and authentic personification; i.e. living your most true and highest potential self.